This is a super easy way to add delicious flavour to your marshmallows. Line a small slice tray (or loaf tin) with baking paper. Place the sugar and jelly crystals in the TM Bowl. Mill 5sec/Speed 9. Add the gelatine and hot water to the jelly crystals. Dissolve 3min/100 degree C/Speed 3. Use the spatula to ensure that all the sugar and jelly crystals have dissolved. Add the cold water and check the temperature. When the liquid has cooled to below 50 degrees and the butterfly whisk. Whisk 8min/Speed 3.5. Pour the mixture into the prepared tray and refrigerate until set. Once the marshmallow has set remove it from the tray by lifting the paper out of the pan. Coat another piece of baking paper with a thin layer of either coconut or cornflour. Turn the marshmallow over so the sticky side rests on the coconut. Carefully remove the baking paper from the top of the marshmallow and coat with more coconut or cornflour. 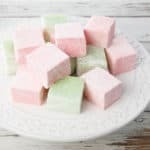 Slice the marshmallow into cubes, coating all sides with the coconut. Any flavour of jelly crystals can be used for this recipe.